OLAS Brings Brazilian Carnival to Gustavus! 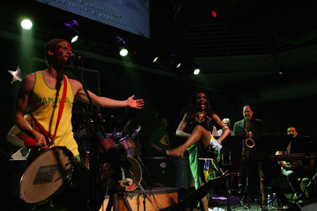 On Sunday, February 26th a 12 person Brazilian band under the direction of Robert Everest will be performing in Alumni Hall. 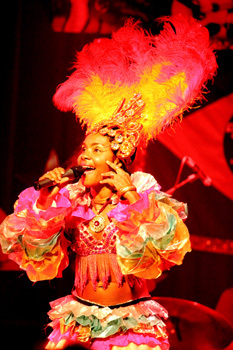 The featured singer is well-known Bahian sensation: Dandara. They will all be performing over the weekend in full-fledged carnival-style in the Cities. 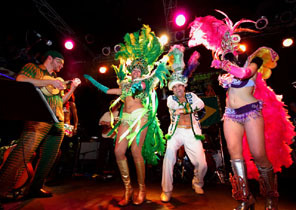 For more information check out: Carnaval Brasileiro. To finish their tour of Minnesota they will be making a stop at none other than our prestigious campus. Let’s be sure to show them how quickly we pick up their moves! Current OLAS (Organization of Latin American and Spanish Cultures, formerly known as Orgullo Latino Association) co-chairs Janet Montes-Osorio and Daniel Martin have been planning this event for months. Patric Giesler (Soc/Antrho & LALACS) and Angelique Dwyer (Spanish, LALACS) have been advising the event planning. OLAS members are excited to get the ball rolling on a wider representation of Brazilian cultures on campus. LALACS (Latin American, Latino/a and Caribbean Studies) could not be more supportive of their efforts! Other excited sponsors are: the Diversity Center, MLLC, Soc/Anthro and Crossroads. There will be LIVE music, professional SAMBA dancers, Brazilian appetizers and non-alcoholic caipirinhas!